St. Saviour’s Union Infirmary (a workhouse hospital) was was built in 1885 in East Dulwich Grove. It was designed by local architects, Henry Jarvis & Sons, and opened in 1887 with a capacity of 723 beds. The infirmary was constructed with a pavilion layout: a large administrative block with two wings was flanked on either side by a pair of three-storey wards in the Florence Nightingale style. The twenty four wards contained 26-30 beds along with a two-bed isolation ward. In 1902, the hospital was renamed the Southwark Union Infirmary. Dulwich Hospital ca. 1900 from Penoyre Prasad website. During World War I, the infirmary was requisitioned by the War Office and transformed into Southwark Military Hospital. The number of beds was increased to 820 and about 12,522 wounded soldiers passed through the hospital, of whom only 199 died. 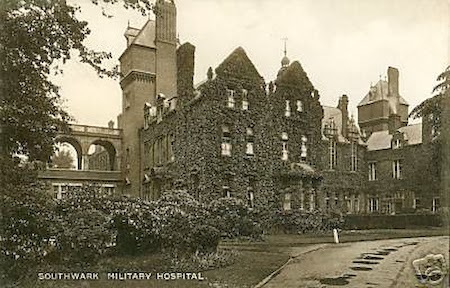 Southwark Military Hospital (Dulwich Hospital) ca. 1914-1918 - from Gillies Archives. After the war, the hospital was returned to the Guardians of the Poor of the Parish of Southwark and was renamed the Southwark Hospital in 1921. In 1931, after the abolishion of the Poor Law in 1930, the London County Council took over administrative control of the hospital which was renamed Dulwich Hospital. The number of beds was reduced to 423 and several additional facilities were built including a new operating theatre, pharmacy and new boiler house. 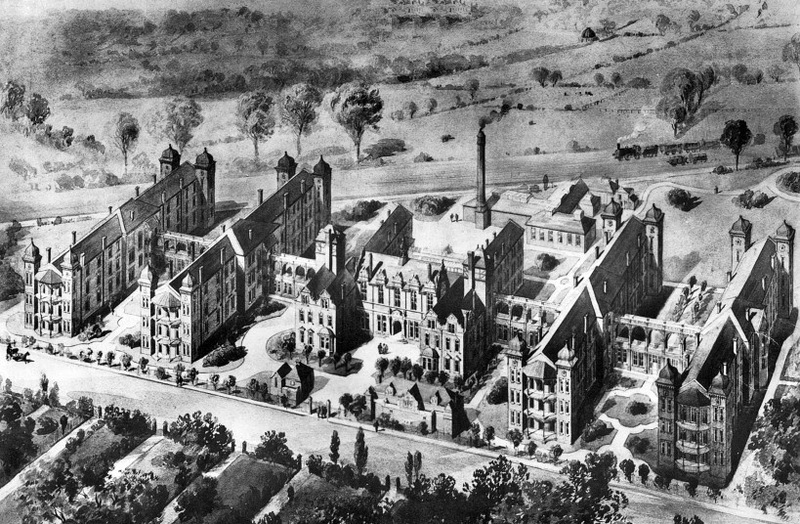 During World War 2, Dulwich Hospital never received a direct hit from any bombs, although several explored nearby. Josef Jakobs was taken to Dulwich Hospital on February 3, 1941. Having been captured on February 1 with a broken ankle, Josef had received initial treatment at Brixon Prison Infirmary. Unfortunately, Josef's injury was so severe that it required treatment at a regular hospital facility. 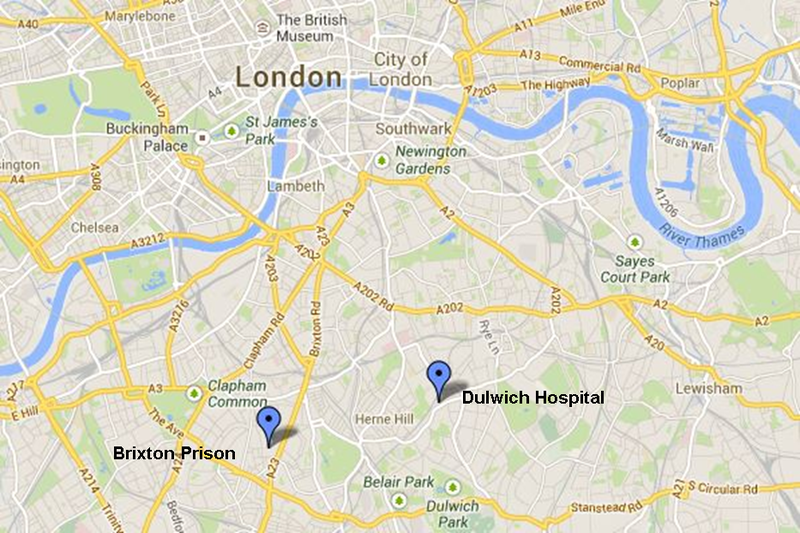 Google Map showing the location of Brixton Prison & Dulwich Hospital. Since secrecy was paramount in the case of captured German spies, Josef was admitted to Dulwich Hospital with the cover story that he was a Prisoner of War, a German airman who had ejected from his aircraft and injured his ankle upon landing. 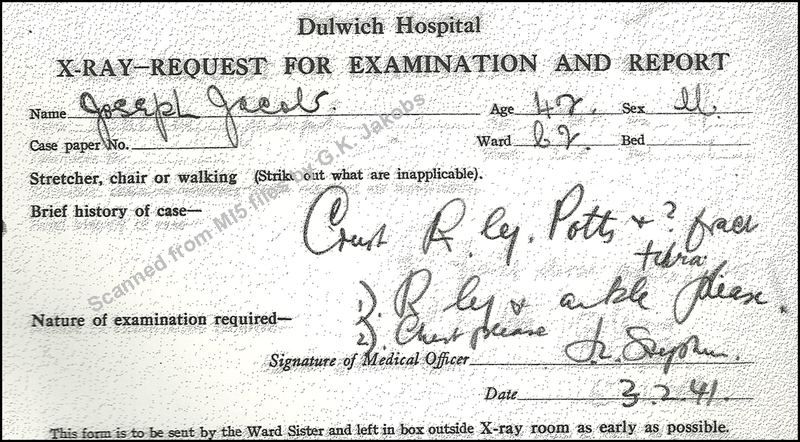 Upon arrival at Dulwich Hospital, Josef's ankle and chest were x-rayed. The doctors noted that Josef had a Potts Fracture with a "comminuted fracture of the tibia and fibia". Essentially, his ankle had been rolled inwards and he had a shattered lower leg. The doctors operated on Josef's leg under general anesthetic and placed it in plaster. During his recovery, Josef was placed in Ward C2 behind a screen to separate him from the other patients. Over the next week, Josef's leg was placed in traction and received fresh plaster every day. In mid-February, Josef developed a temperature (102.5 F) and an septic infection at the site of his ankle injury which was treated with sulfanilamide. Over the next 6 weeks, Josef's ankle slowly improved. Josef was released from Dulwich Hospital to Ham Common (Latchmere House) on March 26, 1941. A day or two later, Josef had a relapse and was transferred to Brixton Prison Hospital where he remained until April 15, 1941 when he was transferred back to Ham Common. Josef clearly received excellent treatment at Dulwich Hospital. The doctors did their best for him and for his badly fractured leg. While the officers at the interrogation camp at Latchmere House (Ham Common) were eager to question Josef, the doctors at Dulwich Hospital were most concerned with saving his leg and life. The Dulwich Hospital site now comprises a large secondary school "The Charter School East Dulwich" (since January 2019) and will also have a community health hub from next year. The central "chateau" building is preserved as is the WW1 cross (now listed) commemorating WW1 soldiers at the hospital. The Dulwich Society - Whither the Dulwich Hospital Site? by Sue Badman. The Dulwich Society - The Future of Dulwich Hospital by Bill Higman. National Archives, Kew - MI5 files on Josef Jakobs. There are many references to Josef Jakobs on the internet. The Trivia Library entry provides a fairly long article and is often referenced by other websites. The article on Josef is essentially a repeat of an article taken from The People's Almanac, a series of reference books published between 1975 and 1981 by David Wallechinsky & Irving Wallace. Unfortunately, some of the information in the article is dated and incomplete. There are several glaring errors which have been corrected below. The original Trivia Library statements are italicized. The accurate information has been obtained from the official MI5 files housed at the National Archives in Kew. MI5 files - He was found the morning of February 1 at 8:30 am by two farmers after Jakobs fired his pistol into the air. Members of the Home Guard was summoned by the two farmers. Trivia Library - Paragraph 3 - He was taken to Brixton Prison in London, where he was interrogated by counterintelligence officers to see if he could be turned into a double agent. Since he was a dedicated Nazi, they decided no military use could be made of him. MI5 files - He was taken from Ramsey Police Station to New Scotland Yard on February 1, where he gave a voluntary statement to Major T.A. Roberston. On February 2, he was taken to Latchmere House (Camp 020), where he was interrogated by MI5 officers. He agreed to cooperate with the English authorities. Due to his broken ankle, the length of his hospitalization (2.5 months) as well as the public nature of his capture, he was not considered suitable as a double-cross agent. Trivia Library - Paragraph 3 - He was given a military court-martial and sentenced to death, despite the fact that he had not actually committed espionage. MI5 files - Jakobs was tried by court martial on August 4 & 5, 1941, under the Treachery Act 1940. According to the Act, the intention to commit an act harmful to His Majesty's forces was sufficient for a guilty verdict. Trivia Library - Paragraph 4 - Other spies... were hanged in civil prisons, but for unspecified reasons Jakobs was taken to the forbidding Tower of London. There he was confined in a small cell in the Waterloo Barracks, where the crown jewels are now housed. MI5 files - Jakobs was transferred from Latchmere House to Wandsworth Prison in late July, where he remained until August 15, 1941 when he was transferred to the Tower of London. He was executed at the Tower of London by firing squad because he was a soldier and not a civilian. Trivia Library - Paragraph 5 - He steadfastly refused to see a priest, even during the last moments. MI5 files - Jakobs requested a Catholic priest in late July. A military padre was assigned to minister to Jakobs and saw him daily until the morning of his execution. The website is based on a book published in the late 1970s, before the MI5 files on Josef Jakobs were released to the National Archives. The information on Josef Jakobs is not accurate. 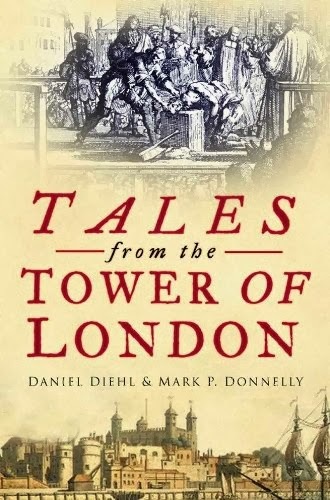 Tales from the Tower of London, Daniel Diehl & Mark P. Donnelly, The History Press, 2004 edition. This book receives Average to Good reviews on Amazon. Several Amazon reviewers have noted that the book is rife with errors and historical inaccuracies. While their comments focus on inaccuracies from chapters that focus on the medieval period, I thought I would review the chapter on Josef Jakobs. Chapter 15 is entitled The Weatherman: Josef Jakobs: 1941. The authors begin by mentioning the damage caused to the Tower during World War 2 and then reference Rudolf Hess and his brief incarceration within the Tower. From that point onwards, facts are in short supply but errors and fanciful flights of imagination are common. It would be too much to highlight and correct all of the errors contained within this chapter. The dramatic scene that played out within the Tower in 1991 is pure fiction. No middle-aged daughter (or any relative) of Josef Jakobs ever approached a Yeoman Warder asking to see the location of her father's execution. Josef's only daughter died in 1946. I visited the Tower in 1991 in the company of two well-known military historians who had arranged a private tour of the Tower. The Governor of the Tower conducted the tour but never presented me with a Bible or a pair of reading glasses. In describing Josef's landing and capture near Ramsey in Huntingdonshire, the authors have taken liberty with many details. The farmers were on their way to work, not walking their dogs. Josef was not unconscious when they found him. He was not taken to the local hospital. Nearly every sentence contains some form of inaccuracy or exaggeration. There is also a glaring inconsistency within the book itself. 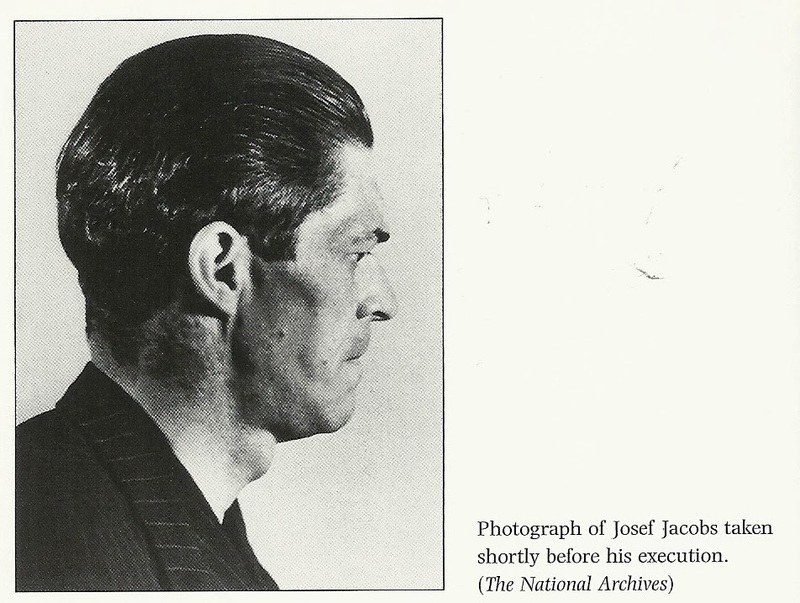 The authors state Josef was balding and yet include a side-view photograph of Josef taken by MI5 which clearly shows that Josef had a full head of hair. The section that deals with Josef's incarceration and interrogation in London is a confusing mishmash of facts and fantasy presented within a warped timeline. The authors have stitched together information from Josef's MI5 interrogations as well as his court martial. In the process, they have lost the factual context of the information. Josef was initially taken to New Scotland Yard before being sent to the hospital ward of Brixton Prison where he only spent a few days. He was quickly transferred to Dulwich Hospital due to the severity of his injury, where he spent the next two and a half months. From there, Josef made his way to Latchmere House and eventually Wandsworth Prison. The authors allude to a "mountain of far more damning evidence" that called Josef's story into question. I am not aware of any documents received from the Swiss authorities and the authors provide no reference for this information. Finally, Josef was never sentenced to death by hanging at his court-martial. His sentence was always death by firing squad. The authors create quite a bit of drama surrounding Josef's execution. Unfortunately, once again, they have their facts wrong. Josef was transferred to the Tower of London on August 15, 1941, not August 13. He was not driven from the Waterloo Block to the firing range. The cloth pinned to his clothing was white, not black, etc. I could continue to point out the many errors in this chapter but will end with the last two paragraphs of the chapter.I did see the chair in 1991 and at that time was asked if our family had any objection to it being put on display. We had no objections. The chair in question is not riddled with small, round holes surrounded by dark stains. Josef Jakobs file, Public Records Office, Kew - there are actually six files which contain a significant volume of information on Josef. Unfortunately, very little of this information has made its way into the book. What has made its way in has been warped. 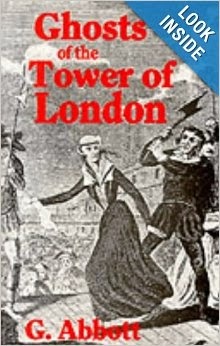 Shot in the Tower by Leonard Sellers, 1997 - this book deals with spies executed at the Tower during World War I. There is a very short reference to Josef in the appendix. Hitler's Jewish Spies, Jerusalem Post, 1999 - This newspaper article contains a scant 160 words on Josef and has its own inaccuracies. The authors have a flare for the dramatic. I have no issue with incorporating drama into often dry historical accounts. I do object to the distortion of historical facts in the interest of "a good story". This particular "Tale from the Tower" is more fiction than non-fiction. Tourists in London flock to Buckingham Palace and the Wellington Barracks to see Changing the Guard. It is a spectacular event in which the company on duty assembles on the parade ground of Wellington Barracks and then makes its way to Buckingham Palace. The soldiers that guard the Queen's residences are collectively known as the Queen's Guard and are normally drawn from the five Foot Guards regiments stationed at Wellington Barracks and Woolich. The Queen's Guard soldiers are responsible for guarding Buckingham Palace, St. James Palace and the Tower of London, still technically a Royal Residence. The five Foot Guards regiments are the Grenadier Guards, Coldstream Guards, Scots Guards, Irish Guards and Welsh Guards. The Guards ceremonial uniform is one of the most iconic uniforms in the world. Its black trousers, red tunic and bearskin hat are easily recognizable and often imitated. At first glance, the different Guards regiments may appear difficult to distinguish, but there are differences in the tunics and the plumes worn on the bearskin hats. A detachment composed of one officer, six non-commissioned officers and fifteen soldiers are stationed within the Tower of London. They provide a guard for Queen's House, a Royal Residence, and for Waterloo Barracks which houses the Crown Jewels. Every evening, at exactly 9:52 pm, the Guards accompany the Yeoman Warder (a.k.a. Beefeater) to the entrance of the Tower to lock the gate. This Ceremony of the Keys has been performed nightly for 700 years, the longest running military ceremony in the world. The duties of the Guards are not just ceremonial. During World War 2, a detachment of Guards performed a more solemn duty in defense of the British Empire. On the morning of August 15, 1941, eight Scots Guards served as the firing squad that executed Josef Jakobs at the Tower of London. The lint circle that had been pinned to Jakobs' chest, and which was pierced by five bullets, was collected by one of the soldiers. 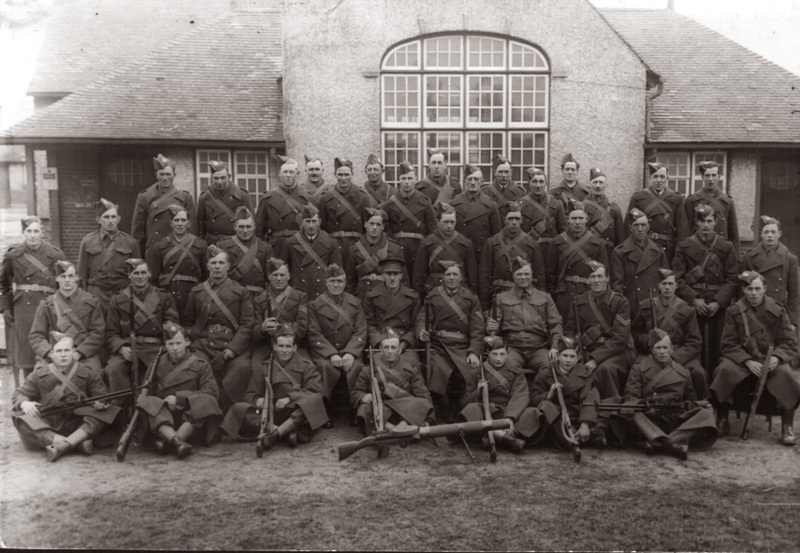 Its location remained a mystery until 1976 when, after many enquiries, Winston Ramsey, editor of After the Battle Magazine, learned that it was being held by the Scots Guards at the Guards Museum. Ramsey took a photograph of the lint circle (After the Battle Magazine - Volume 11) which was reprinted in Nigel West's book, MI5: British Security Service Operations, 1909-1945. The Guards Museum (located at Wellington Barracks) is open to the public and contains an impressive display of all things related to the Guards, documenting the histories of the five regiments from inception to the present day. The lint circle is currently not on display in the Guards Museum (2012). There are many websites on the internet that make reference to Josef Jakobs. A plethora of sites feature the trivia question: Who was the last person executed in the Tower of London. In addition to the trivia sites, there are several that contain grossly inaccurate information (reviews in progress). There are also several that present relatively accurate, and in some cases, well researched information. One of these latter sites is that of Stephen Stratford. 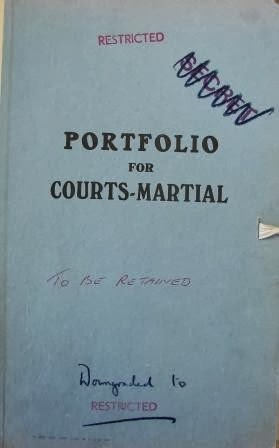 It is very clear that Stratford has viewed Jakobs' Court Martial file as well as his letter of petition to the King, both held at the National Archives in Kew. While most of the Jakobs information presented on Stratford's site is accurate, there are some minor factual errors and typographical mistakes in the summaries of the witness statements. Later that day, a post-mortem was performed by Bernard Spilsbury. One shot had hit Jakobs in the head, the other seven had been around the target area. An inquest held that afternoon decided that Jakobs had died of "Injuries to the heart caused by the passage of bullets", and the inquest verdict was "Execution of judicial sentence of death in accordance with military law". To date, I have been unable to discover the original source of the statement that "one shot had hit Jakobs in the head". Stratford's pages on Jakobs do not cite references for any of the information. If the statement on Jakobs' execution is accurate, one naturally wonders, did one soldier's shot go wildly awry or was the shot to the head administered by the officer of the firing squad to finish the job. James Henry Godfrey (Harry to his friends and family) was a lucky man. 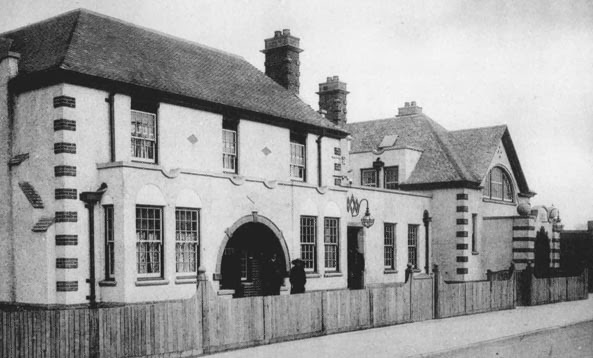 He was born in 1903 in the village of Ramsey in Huntingdonshire. His parents, Harry & Sarah, timed his birth just right, for Harry ended up being too young to fight in World War I. By the time World War II rolled around Harry's job as a farm labourer was a reserved occupation that exempted him from overseas service in His Majesty's Armed Forces. But Harry was also a brave man and wanted to serve his country so when the call went out in May 1940 for Home Guard volunteers, Harry stepped up and was the fourth recruit to join the Ramsey Home Guard where he soon received the rank of Lance Corporal. Harry Godfrey was also a family man. In 1921 he married his wife Doris and together they had four children, Ronald, Sylvia, Barbara and Jean. Life was good for Harry Godfrey, if perhaps a bit boring on the Home Guard front. But all of that changed on the morning of February 1, 1941 when Harry was working at Wistow Fen Farm getting a chaff-cutter started up. His morning routine was disturbed when, at 8:45 am, Harry Coulson, a labourer from a nearby farm rushed into the yard with the news that a German parachutist had landed in a field at Dovehouse Farm. Harry immediately phoned his superior Captain Newton and reported the news. 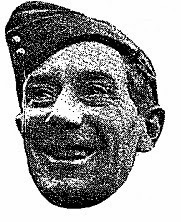 Harry accompanied Coulson back to the field where another farm labourer, Charles Baldock guarded the parachutist. Harry asked the man what he was doing and the man replied "Me solo flying - me bale out 100 meters". A practical man, Harry replied "Well, where the blazes is your plane?" Harry asked the man if he was hurt and was told that his right ankle was injured. Lifting up the parachute, Harry straightened the man's legs and tied them together with a scarf in a makeshift splint. Harry asked the man where he was from and the parachutist said "Me not in this war, from Luxembourg, made to come." After Captain Newton and Lieutenant Curedale of the Home Guard arrived, Harry joined in searching the parachutist and found a variety of items, black bread sandwiches, brandy, identity cards and money. Harry also noticed that the parachutist was a heavy smoker and was surrounded by 30 cigarette butts. He would have smoked more but his lighter had run out of petrol. As the group of men loaded the parachutist into a hastily procured horse-drawn cart, Harry kicked a case that was buried in the soil. It turned out to be a wireless transmitting set and convinced Harry that they had indeed caught themselves a German spy. Although the man was quite well-dressed, with overcoat and suit, Harry noticed that his shoes were down at the heel and badly worn. The man was also in poor physical condition weighing only about 9 stone (126 lbs). On the way to the police station in the horse-drawn cart, the parachutist apparently offered Harry his silver wrist watch which Harry accepted and promptly turned over to the military authorities. Harry hung around the police station while the man was questioned and learned that his name was Josef Jakobs and that he had a wife and three children back in Germany. He had landed the previous evening and was unable to move from the spot due to a severely broken ankle. Jakobs was eventually taken off to London by the Secret Service and Harry's life continued its normal course with a few aftershocks. On February 2, Harry gave a statement to Sergeant Pottle of the Huntingdonshire Constabulary regarding his role in the capture of Jakobs. In early August, Harry was called down to London where he testified in the court-martial of Jakobs who was on trial under the Treachery Act. It was impressed upon Harry that he should share nothing about the court-martial case. On August 16, 1941, however, things heated up again after Jakobs was executed by firing squad at the Tower of London. The media descended upon the sleepy village of Ramsey seeking the Home Guard hero who had captured the nasty Nazi spy. All fingers pointed towards Harry Godfrey and for a few short days, Harry was the media's darling. He was living proof that the Home Guard force did make a difference in the defense of the realm. He had caught a German spy and prevented that spy from endangering English lives. Harry was a hero. Lest you think that Harry divulged secret information from the court martial, Harry only confirmed information that the media people already had in their possession. Harry Godfrey was also a humble man and according to his daughter Sylvia, Harry never boasted about the capture. He was a brave man and brave men don't need to strut their stuff. The rest of Harry's life seems to have been relatively serene. He and his wife Doris celebrated their 70th wedding anniversary in 1991 and even received a congratulatory telegram from Queen Elizabeth. Doris passed away in 1995 and Harry followed her in 1997 in the village of Ramsey. Harry and Doris had numerous grandchildren and even a few great grandchildren. Of Harry's children, only Jean is still alive with Sylvia passing away in 2013, Ron in 2009 and Barbara at an earlier date. Daily Express Newspaper, August 16, 1941. Peterborough Telegraph Newspaper, August 18, 2006. On the night of January 31, 1941, Josef Jakobs descended by parachute just southeast of the sleepy village of Ramsey, Huntingdonshire. His descent in the darkness was unnoticed. His capture the following morning was inevitable given that he had broken his ankle either departing the aircraft or upon landing in a potato field. He was discovered on the morning of February 1 by two farmers walking to work who heard the shots that Jakobs fired from his pistol. Various documents and first-hand accounts from 1941 mention several geographical features marking Jakobs' landing site. This information is all helpful for gleaning a general idea of where Jakobs landed. A map published on the RAF Upwood site shows the general location of Dovehouse Farm and the site of Jakobs' landing. 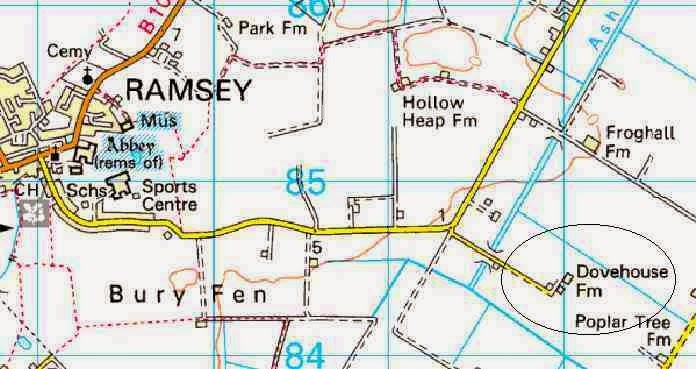 In 1976, Winston Ramsey of After the Battle Magazine, traced Josef's landing point to a specific location on Dovehouse Farm, probably with the assistance of locals who still remembered the memorable event. The map referred to is a military map and apparently very few remain in existence. 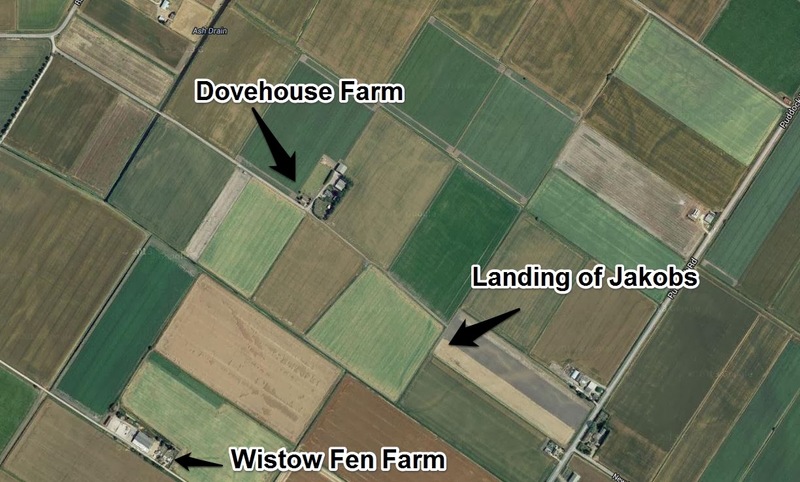 The bearing and distance from Dovehouse Farm do however provide enough information to identify Jakobs landing point with a fair degree of certainty. In January 2010, Winston Ramsey graciously took me on a tour to the village of Ramsey. I was able to visit the village and the surrounding countryside around the same time of year that Jakobs would have landed at Dovehouse Farm. Not much has changed in those 60 years between 1941 and 2010. Farmers still tilled their soil and planted crops.The cold wind still blew over open fen. It was a wonder that the Germans thought that any spy dressed in a business suit would have managed to blend into village life and succeed in his mission. Did Josef Jakobs land in North Stifford, Essex? The mystery and secrecy surrounding the capture of Josef Jakobs in 1941 has often made it difficult for researchers to track down accurate information on Jakobs and the circumstances surrounding his arrival in England. Over the years, two landing sites have been mentioned for Jakobs: North Stifford Village in Essex and Ramsey Village in Huntingdonshire. "On the night of 31st January 1941, Josef Jakobs, a German Spy, was dropped by parachute and landed near a wood close to Ardale School. Under his flying suit he wore civilian clothes and he was equipped with a wireless transmitter, English money, food, brandy and a traditional German sausage. He also had a forged identity card in the name of James Rymer. Several people saw him land and informed the Home Guard. He was quickly captured by the army. Josef Jakobs was taken to Brixton prison and was found guilty of being a spy at a Court Martial in August. He was taken to the tower of London and shot." "On the night of 31 January 1941, wearing a parachute, he [Jakobs] boarded an aircraft which then took off and headed for southern England. Once over the estuary of the River Thames, the pilot navigated by following the course of the river as far as Gravesend and Greenhithe, then turned due north to drop his passenger over North Stifford, Essex." While Abbott's book did not provide a source for the information, the North Stifford website did contain link to a second site, the Trivia Library. This site is apparently based on outdated information from "The People's Almanac", a series of books published between 1975 and 1981. 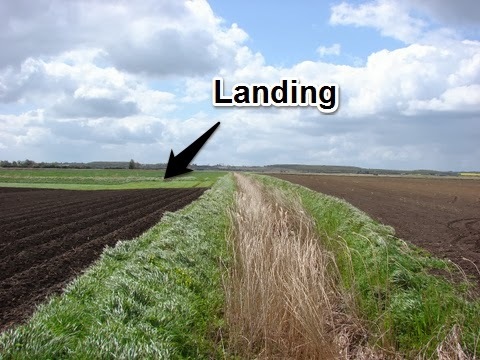 The article contains several errors, one of which is Jakobs' landing site. No source references are are listed for the information contained within the Almanac or the Trivia Library. The most likely source for all of these accounts, and the earliest print reference to North Stifford Village, is the first edition of After the Battle Magazine, Volume 11. Sir Winston Ramsey, editor of After the Battle Magazine has stated that this edition was an error and was corrected in second edition of Volume 11. In the mid 1970s, when Ramsey was researching the circumstances surrounding Jakobs' landing, capture and execution, accurate information was difficult to uncover due to the secrecy surrounding the case. Although After the Battle quickly corrected the information in Volume 11 and published a second edition, the North Stifford information spread into The People's Almanac and, over the years, has continued to surface in various references to Jakobs. It is entirely possible that another spy landed in North Stifford during World War II, but from the information contained within the National Archives, it is quite clear that Josef Jakobs was not that spy, for he actually landed near Ramsey Village in Huntingdonshire.